After three months of appeals and advocacy, the Kent County Commission has taken no action to end the Kent County contract with ICE. After over three months of appeals to the Sheriff and the Kent County Commissioners, there has been no action by Kent County’s elected officials to end the unnecessary and violent contract with ICE. GR Rapid Response to ICE receives calls every week from community members who have been taken, or whose family members have been taken, and our community is living in fear over who will be kidnapped next. Immigrants and their loved ones continue to suffer huge emotional and financial blows because of ICE’s reign of terror. 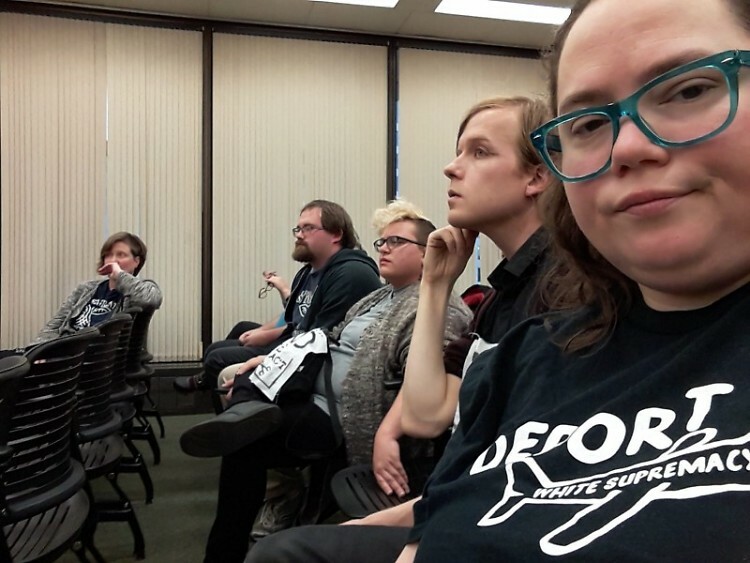 Movimiento Cosecha GR and GR Rapid Response to ICE members once again attended the Kent County Commission meeting to ask our elected officials to take one small step to reduce the harms being done to our immigrant neighbors. Members of the immigrant community spoke about their experiences coming to the U.S. in search of a better life and the ongoing fear and harm that is done to them--friends lost, families lost, lives disrupted. “We just work, we pay our taxes, and we don’t deserve what you’re doing to us,” said Rita, a Kent county resident and member of the immigrant community. “So many families are getting ripped apart, and it seems like you can do something about it, but you’re not doing anything about it,” said Virginia, a Kent county resident. 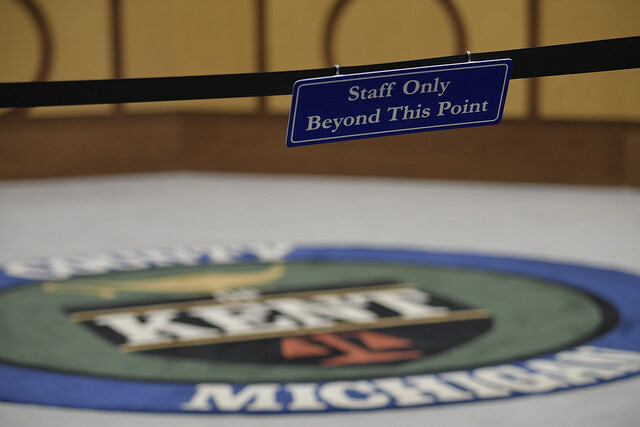 At the previous meeting, the Kent County Commission separated the public from the Commissioners, relegating them to a separate room. As Cosecha GR and Rapid Response organizer Karen Meyers said, “Rather than take action, the Commission has just added more barriers between themselves and the public.” The Commission has reacted to appeals from our immigrant community members, social workers, parents, and other ordinary Kent County citizens with increasing hostility and disrespect.. “What I’ve seen from this body is increasing distance from the people. The reason that people organize and disrupt powerful bodies is not because it’s super fun for us, but because it’s a serious issue that’s causing immediate and lasting harm. I don’t know how to make you care about that, but I feel like you should. Because you’re our elected representatives,” said Sarah Doherty, GR Rapid Response to ICE organizer. 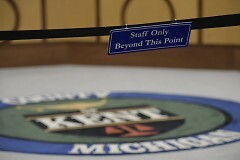 The Kent County Commission has shown that it is uninterested in hearing the concerns of the people or taking action to wield their considerable influence over the Sheriff’s department, which is under their purview, to repair the relationship between the Kent County’s law enforcement body and the immigrant communities that live in fear. The community members walked out of the meeting after public comment. After community members left there was some “miscellaneous” discussion by commissioners. Commissioners Bulkowski, Melton, and Hennessy called for a task force to study the issue. Commissioner Melton said, “It is not possible for me personally to sit and listen to the story and angst that I hear from so many of our community members who have been here month after month after month. So I again am asking to the board chair and administrator to look into a team or a task force so that we can better support our immigrant citizens and those who have reached out to us as their elected officials. 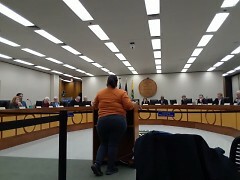 In my opinion we have been elected to maintain and hopefully improve the quality of life here in Kent County for all of our citizens, not just for a few.” Commissioner Womack said he thought that after three and a half months it was time for the Commission to draft a resolution recommending the end of the contract with ICE and put it to a vote so that each commissioner could be on record representing their constituents. Several commissioners expressed that they were glad that this meeting was open to the public after the last one; the silence of the majority of the commissioners was notable. In three and a half months not one commissioner has put a discussion of the Kent County contract, nor a draft of a resolution to recommend the Sheriff’s department end its contract with ICE, on the Commission’s agenda. This piece written by Sarah Doherty with input from Movimiento Cosecha GR and Rapid Response to ICE organizers.